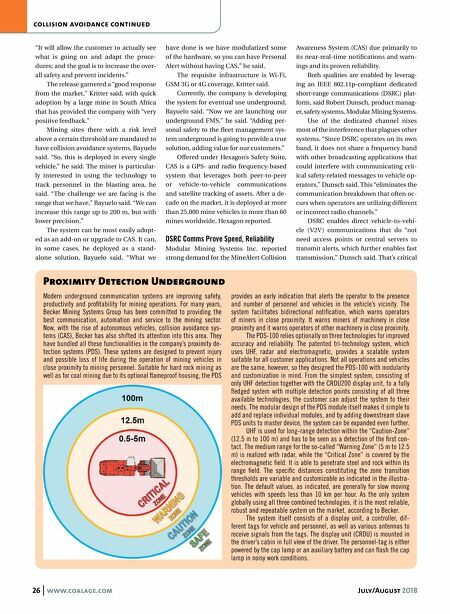 26 www.coalage.com July/August 2018 collision avoidance continued "It will allow the customer to actually see what is going on and adapt the proce- dures; and the goal is to increase the over- all safety and prevent incidents." The release garnered a "good response from the market," Kritter said, with quick adoption by a large mine in South Africa that has provided the company with "very positive feedback." Mining sites there with a risk level above a certain threshold are mandated to have collision avoidance systems, Bayuelo said. "So, this is deployed in every single vehicle," he said. The miner is particular- ly interested in using the technology to track personnel in the blasting area, he said. "The challenge we are facing is the range that we have," Bayuelo said. "We can increase this range up to 200 m, but with lower precision." The system can be most easily adopt- ed as an add-on or upgrade to CAS. It can, in some cases, be deployed as a stand- alone solution, Bayuelo said. "What we have done is we have modularized some of the hardware, so you can have Personal Alert without having CAS," he said. The requisite infrastructure is Wi-Fi, GSM 3G or 4G coverage, Kritter said. Currently, the company is developing the system for eventual use underground, Bayuelo said. "Now we are launching our underground FMS," he said. "Adding per- sonal safety to the fleet management sys- tem underground is going to provide a true solution, adding value for our customers." Offered under Hexagon's Safety Suite, CAS is a GPS- and radio frequency-based system that leverages both peer-to-peer or vehicle-to-vehicle communications and satellite tracking of assets. After a de- cade on the market, it is deployed at more than 25,000 mine vehicles in more than 60 mines worldwide, Hexagon reported. 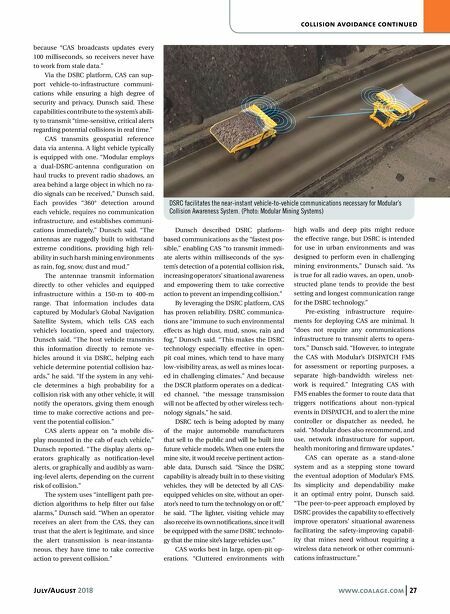 DSRC Comms Prove Speed, Reliability Modular Mining Systems Inc. reported strong demand for the MineAlert Collision Awareness System (CAS) due primarily to its near-real-time notifications and warn- ings and its proven reliability. Both qualities are enabled by leverag- ing an IEEE 802.11p-compliant dedicated short-range communications (DSRC) plat- form, said Robert Dunsch, product manag- er, safety systems, Modular Mining Systems. Use of the dedicated channel nixes most of the interference that plagues other systems. "Since DSRC operates on its own band, it does not share a frequency band with other broadcasting applications that could interfere with communicating crit- ical safety-related messages to vehicle op- erators," Dunsch said. This "eliminates the communication breakdown that often oc- curs when operators are utilizing different or incorrect radio channels." DSRC enables direct vehicle-to-vehi- cle (V2V ) communications that do "not need access points or central servers to transmit alerts, which further enables fast transmission," Dunsch said. That's critical Proximity Detection Underground Modern underground communication systems are improving safety, productivity and profitability for mining operations. For many years, Becker Mining Systems Group has been committed to providing the best communication, automation and service to the mining sector. Now, with the rise of autonomous vehicles, collision avoidance sys- tems (CAS), Becker has also shifted its attention into this area. They have bundled all these functionalities in the company's proximity de- tection systems (PDS). These systems are designed to prevent injury and possible loss of life during the operation of mining vehicles in close proximity to mining personnel. Suitable for hard rock mining as well as for coal mining due to its optional flameproof housing, the PDS provides an early indication that alerts the operator to the presence and number of personnel and vehicles in the vehicle's vicinity. The system facilitates bidirectional notification, which warns operators of miners in close proximity. It warns miners of machinery in close proximity and it warns operators of other machinery in close proximity. The PDS-100 relies optionally on three technologies for improved accuracy and reliability. The patented tri-technology system, which uses UHF, radar and electromagnetic, provides a scalable system suitable for all customer applications. Not all operations and vehicles are the same, however, so they designed the PDS-100 with modularity and customization in mind. From the simplest system, consisting of only UHF detection together with the CRDU200 display unit, to a fully fledged system with multiple detection points consisting of all three available technologies, the customer can adjust the system to their needs. The modular design of the PDS module itself makes it simple to add and replace individual modules, and by adding downstream slave PDS units to master device, the system can be expanded even further. UHF is used for long-range detection within the "Caution-Zone" (12.5 m to 100 m) and has to be seen as a detection of the first con- tact. The medium range for the so-called "Warning Zone" (5 m to 12.5 m) is realized with radar, while the "Critical Zone" is covered by the electromagnetic field. It is able to penetrate steel and rock within its range field. The specific distances constituting the zone transition thresholds are variable and customizable as indicated in the illustra- tion. The default values, as indicated, are generally for slow moving vehicles with speeds less than 10 km per hour. As the only system globally using all three combined technologies, it is the most reliable, robust and repeatable system on the market, according to Becker. The system itself consists of a display unit, a controller, dif- ferent tags for vehicle and personnel, as well as various antennas to receive signals from the tags. The display unit (CRDU) is mounted in the driver's cabin in full view of the driver. The personnel-tag is either powered by the cap lamp or an auxiliary battery and can flash the cap lamp in noisy work conditions.